Better And Better: Weather crime doesn't pay. Maybe you weren't aware of it. Maybe I wasn't aware of it. 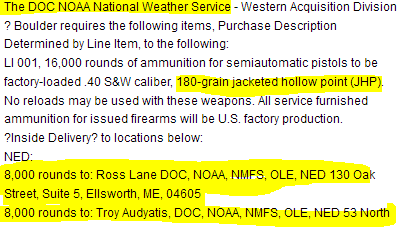 But the National Oceanic and Atmospheric Administration* apparently has gun-toting cops, and they need ammo. Bunches of it. ‎"The ammunition is standard issue for many law enforcement agencies and it will be used by 63 NOAA enforcement personnel in their firearms qualifications and training." "That's right, buddy-- it doesn't pay to pad your drought by pouring out your rain gauges every night. Book'm, Danno." *The very agency from whom for years I've been getting the spectacular sat/radar composite weather images, like the one on the previous blog post. Actually, a correction has been issued. 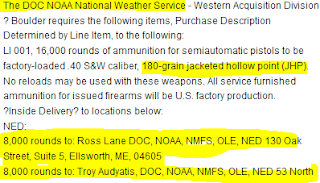 The ammo is for 68 Fish and Wildlife officers with NOAA. You know, all but the most violent of storms do respond somewhat to a show of arms. :) I thought that it would be something like that, but the thought of a weather cop seemed kind of funny to me. I suppose that having specialized LEOs in charge of open water fisheries makes since. No enforcement means that the schools get depleted, and everything goes to pot. I certainly don't expect an FBI agent to perform those tasks. I bought my first gun ever at Ray's. A 7-1/2 " Ruger New Model Blackhawk in .45 Colt. Pre-barrel warning. It was my first defensive sidearm as well. On a more serious note- NOAA having its own gun carrying cops - US Fish and Wildlife has an enforcement division, and they even have " Fish" in their name, seems to me USFWS and the Coast Guard could do the "armed fisheries enforcement" stuff, NOAA carrying out this function seems absurdly redundant. As a practical matter, just who do they arrest anyway? Why does it seem in this modern age that every federal agency that has any regulatory activity wants its own cops? This is absurd. The Department of Education has a SWAT team. Absurd. A waste of money, and a really creepy example of the increasing militarization of law enforcement in this country. Greg, I was actually aware of the Ruby story. Actually, there's another Kennedy connection there. While I fully agree that all the agencies don't need SWAT or even LEOs, I'll hold off on condemning NOAA on having fish cops. As I said, that's pretty speccialized enforcement, and works more closely with environmental regs than with street crime and the like. I think that "the increasing militarization of law enforcement in this country" is a fair bit overstated. We all shake our heads at the pictures of NYPD cops in full tac gear (BDUs, tac vests, M4s, helmets) standing out front of their city administration buildings, and at cops going full-on dynamic entry on what should be a simple warrant service. But the fact is, those stories and pictures are in the news because they actually are news. They're not the norm. Sure, we definitely need to keep a weather eye on those guys and prevent them from becoming the norm, but day in, day out, the vast, vast majority of us never tac out, almost never pull the black rifle out of the trunk except for routine administrative purposes, and have never put on a helmet. Sure I've got a tac vest in the back of the car. I've put it on once in the past year, while setting up a perimeter around a mentally-ill armed man's house, and we took that guy into custody by knocking on the door and talking him into stepping outside. You know what? This looks like another blog post.